In the gray days of winter, it's important to have a coat that stands out. Our Indiana winters tend to be one day after another without seeing the sun, and though this winter has been pretty snowy, that's unusual. Our winter months are spent looking at a gray sky, and a barren landscape that's also devoid of color. Hence why I have a (no surprise) red coat. Winter in Indiana requires a splash of color. This winter, I debated about finding a houndstooth coat, because I love how classic it is. But look at this one, from Courreges, in a tattersall weave. It's McCall's 7938 and, in typical Courreges fashion, it's kind of boxy and geometric. The ad says it's shown in black and white, with black binding accents, and buttons by La Mode. I'd make it in navy, and make the accents in velvet or corduroy, for some texture. The ad also says it comes with a suit pattern, too, so I'm surprised they don't show it. I'm sure it follows the scheme of the coat, and is space age all the way -- Courreges' signature look. Just remember -- this coat's bracelet length sleeves would require you to get a pair of beautiful gloves, lest your freeze your forearms off. And yes, I miss the tradition of wearing gloves, because they just dress things up so well. Remember slips? I always hated wearing them when I was a kid, because the static cling drove me nuts. Modern slips don't hold a candle to today's slips, either, because the nylon of the years past is nothing like the stuff they make today. Notice that this 1940 slip is fairly free of any embellishments like lace, ribbons, or flounces, which wasn't unusual a couple of years later, due to World War II fabric rationing. This particular slip is from before the US entered the War, so maybe, sadly, it's a view of things to come. This lovely slip from 1940 is noted in the ad to have "Laton yarn side inserts." Laton was a thread created by the American Rubber Company that made Lastex. I thought that all of the -on threads, like Nylon, Antron, etc. were Dupont products, so it was interesting to see that this one wasn't. No matters, since I think it was a fairly short lived venture, because by 1952, the Laton trademark was registered to a paint company. That's quite an extreme! I have no idea who the model is, or who the designer is (though if it's not Pucci, the print is one of those Pucci wannabees). All I know is that this is Czechoslovakia, in August, 1968. In the middle of a Soviet occupation that squashed attempts at political reform. Pure and simple, this is the proof that you can look fabulous, even in the midst of an occupation. Of course, if you wore this outfit down a street in USA, 2010, you'd better be prepared for some stares, but it's a great indicator of the times. I see it being produced here in the 60's by one of those Tupperware-style loungeware companies who had housewives throw a little party and buy a robe or caftan, like Butterfield 8 or Beeline. Of course, then it would be in cheap polyester, and with a much less interesting print. And probably without the metallic shoes, which appear to have chain embellishments on the of her feet. Balenciaga was just a straight up genius. If it hadn't been for the Spanish civil war, he might have stayed safely ensconced in Spain for his whole life. Instead, he ended up in Paris, where, during World War II, women would risk their lives to travel just to see his line. Balenciaga was a lover of sleeves, which makes this dress so interesting to me. This dress could easily be worn down a red carpet today but most likely minus, alas, the beautiful opera length gloves. And I'm not sure how many other colors this dress would work in. Blue, maybe? I think it's just flat out genius. From his 1955 collection. Photo from Life Magazine, September 5, 1955. Dorothea (Towles) Church was one of the first models of color who hit it big. She was a favorite of Christian Dior's, after he quickly hired her to replace a model who was on vacation. She loved Paris so much that she never returned to California, despite having a husband there who was several years older than her. She was known for her incredibly regal stride on the catwalk. Alas, I can't find a video to show you, but she was amazing, and opened doors for all of the US women of color who would come behind her. She once said "If you're beautiful, (the French) don't care what color you are." 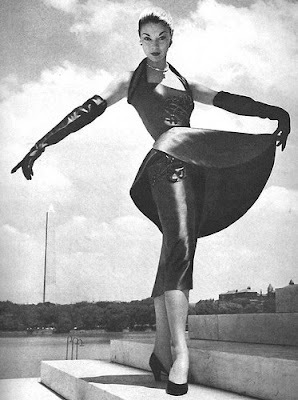 This photo is from a 1955 fashion show. I imagine the color is navy, because navy blue and white are a beautiful combination. And as much as I miss beach coats, I really really love this one, with its cape effect. I wish I could see the shoes, though. 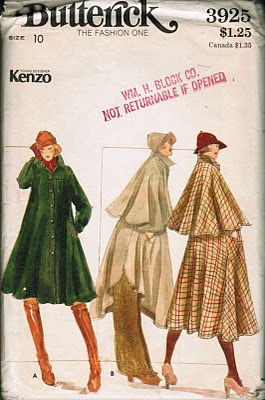 I came across this Kenzo pattern a few weeks back, and fell in love with it. It's got a certain Sherlock Holmes vibe to it, but it's that huge hem that sells it. Kenzo was the one who brought Japanese fashion to the world, and he did it with a lot of hard work. His parents didn't support his dream, so he worked and went to fashion school, purchasing his fabric at flea markets. Perhaps this is how he became so adept at patterns and prints, but the thing I find fascinating is that he liked a large silhouette -- something evident here. Granted, this was the 70s, and disco was in full bloom, but this cape definitely doesn't say disco. Cruise around on the web, and you'll see that Kenzo's fashion meant a lot of flowing loose styles, but with details like gathering and grommets that make loose look fashionable instead of frumpy. Kenzo definitely was true to himself in dancing to his own drummer. But if it meant creating beauties like this, it's just fine with me. I need something pretty today. Who better for my pretty fix than Ceil Chapman? Ceil was well known for her draped bodices, but the pleating on this reminds me of Jean Desses, and is a perfect example of the early 50s. She counted among her clientele Marilyn Monroe, Deborah Kerr, and Elizabeth Taylor, and I can see any of them being able to carry this off beautifully. There's nothing like a bateau neckline to draw the eye up, and show off a toned upper body. I don't know what her inspiration was here, but I see the ocean. I'd leave the rhinestones off the neckline and just wear them as earrings, and add a rhinestone bracelet. It doesn't really matter what you want, because this dress will do all the talking for you, whether it's "come hither" or "eat your heart out Buster, I've moved on without you." To. Die. For. And sadly, SOLD by Memphis Vintage. Happy with something similar? Try this one, in black, available now on ebay. I think I would've loved to be friends with Coco Chanel. Not only was she a genius of fashion, she was a fascinating person. I mean, who else could start out with making raincoats, go bankrupt, switch to millinery and end up dressing everyone who's anyone before commiserating with Nazis and destroying her career, then resurrecting herself as an icon? We should all be so lucky. Well, I'd leave out the Nazis, but the rest makes for some pretty interesting press. Chanel was pretty daring in bringing her dresses forward, because they were loose and short -- a sharp contrast to the corseted, long dresses that came before her. She mastered the chemise, completely changing the landscape of fashion. And don't forget the little black dress, a concept that she created. She was so prolific a designer that she was the only fashion designer named to Time Magazine's Top 100 Most Influential People of the 20th Century. Despite being pursued by many rich men, Coco never married, declaring once to Dorian Leigh that "there are many rich men, but only one Coco Chanel." Truer words were never spoken. 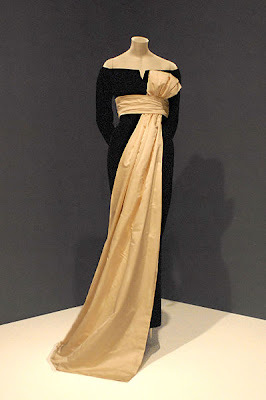 Dress, from 1938, at the Metropolitan Museum of New York. I love sweaters. I was wearing a sweater the night I met my husband. It's now safely esconced on a shelf in my closet, in all its polyester glory. It's a crew neck sweater with a pattern of pink hearts on it, which is pure me. 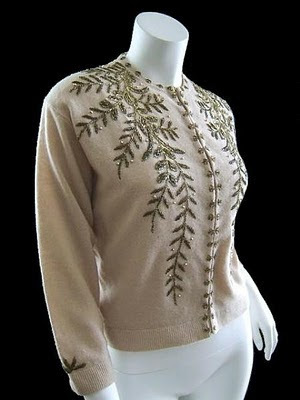 Sweaters have been making an upswing of late, since our lovely first lady favors them so much. She even wore one during the inaugaration parade, and for good reason: cardigans help you create the layers that will keep you warm in the chilly winter temperatures, but you can peel it off if you get too warm. Granted, the J. Crew designs of today don't match the awesomeness of the earlier stuff, but I'll take 'em anyway. Great, isn't it? It's from 1938, which makes it a little early for the sweater girl trend, but the pics are spot on. I love the pattern, too, because it is not only reminiscent of Adrian, but it also will create a bustline and a waist if you don't have one. And a little fact to note: did you know that Garbo left films because they wanted to turn her into a sweater girl? Can you imagine the goddess in a sweater? As you know, there's nothing wrong with a sweater, but some things are just sacrilege. This turned into a domino affect when Adrian also left Hollywood. As he said, " When the glamour ends for Garbo, it also ends for me. She has created a type. If you destroy that illusion, you destroy her.' When Garbo walked out of the studio, glamour went with her, and so did I." I had an epiphany today. I was just wandering around google, mindlessly listening to stuff on the TV that I've DVR'd over the past couple of weeks, when I ran across this tidbit of information: The dress from the photo Dovima and the Elephants is permanently housed at the Indianapolis Museum of Art. The Indianapolis Museum of Art. As in, Indianapolis. As in, MY CITY. Good heavens. I took myself to this very museum and stood in front of this very dress a year and a half ago on my birthday, as a gift to myself, when the Dior exhibit was there. Did I know then that one of the dresses was from the iconic photo that I now have hanging in my office? Nope. Sure, I knew it was from the same collection. But THE dress? No way. I hang my head in shame. But I may just drive myself over to the IMA tomorrow, if the snow allows, to gain a whole new appreciation for their choice in fashion. Now we all know how I love red, so obviously, I love Ecarlate. I really didn't think this was from the H collection, but The V&A is the expert, so I bow to their researchers. It is called Arsene Lupin, and is his contribuation to menswear-inspired fashion. The name even is inspired by a French Sherlock Holmes type detective character who was popular in a series of French books. 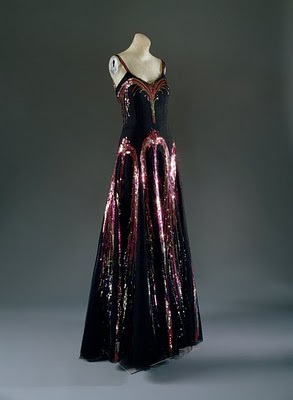 From the Metropolitan Museum of Art, this "Y Evening Dress," which is definitely an echo of Dovima's. Beautiful, yes? Just let me say, after seeing the Dior exhibit here a couple of summers ago, if you ever get a chance to see original Dior's up close: DO IT. You will marvel at the construction and the beauty of it all. He truly was the master. They're predicting 4-7" of snow here tomorrow, which makes me happy, since I'm totally a winter person. I love everything about the cold weather, especially the clothes. There's just nothing like a great winter coat, hat, and gloves. You're seen too often in a coat during the gray days of winter to wear something boring, so spice it up already. Here's a cute double breasted coat from Vyacheslav Zaitzev, with matching fur hat. I'm not a fur person myself, but do understand why it is that people who live somewhere like Russia (where these photos were taken) would want to keep their noggin warm with it. Again, not for me, and nowadays there's too much good fake fur to wear the real deal anyway, but I love this look. Especially the ogling Cossack. Zaitsev is a pretty interesting person, too, because who ever thought about Russian Haute Couture? Certainly not me. Here's someone who, as late as the late 80s, complained to his government about having limited materials to design with. He even said that he was using mannequins from World War II. This, from a man who won international an international competition the next year, against such competitors as Donna Karan, Claude Montana, Hanae Mori, and Byblos. Crazy. I've been minorly harassed by a co-worker that I *must* decorate my office and, admittedly, it is screaming for some color. One of our doctors wants me to put up a mural of the beach, and every time she walks in, she tells me, in graphic detail, what it should look like. While I admit that the blah gray brown of the walls is screaming for color, I've decided to quell my obsession with Dovima by decorating with photos of her and some of her contemporaries. I guess the only problem is that the photos are all black and white, but I love the look of it. I'm on the lookout for more small-ish photos or postcards of Dovima, Dorian Leigh and, at left, Jean Patchett. I've assembled a small collection, but if you know of more, let me know, as I'd love to have a wide variety. 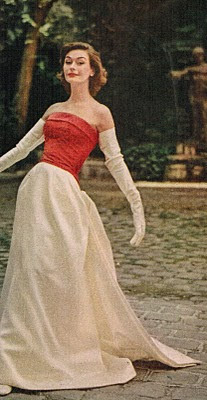 Did you know that the perfect model in the early 1950s measurements were 33 bust and hips, and a waist that was no more than once around her head? This, according to Dior's model Fredy who, I suppose, would know these things. Once around the head. I want to know if that is including foundation garments and waist cinchers, because if not, I don't think it's humanly possible. I haven't measured my head, but I can tell you, it's definitely not large enough. Photo: Garfinckel's ad, circa 1954. 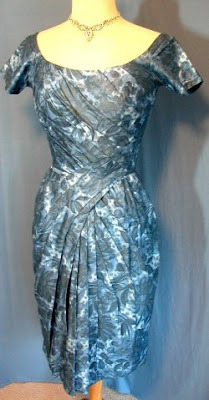 Jo Copeland Dress.